The time has come to reflect and officially bring to a close the York: Gateway to History project. It has been an incredible two years and we at Explore have come together as one Library and Archive service. My role on the project is also coming to an end this week and I can’t believe how far we have travelled since that first week. So here is my personal journey on the project. Enjoy! January 2014 – The activity plan strand of the project gets underway when I started as Community Collections & Outreach Archivist. I was daunted by the challenge but excited to get started! February 2014 – We got straight in and worked with Lord Deramore’s Primary School in Heslington to unlock the history of the school and discover it’s place in the local community. We worked with three fantastic volunteers who wrote a whopping 17,000 word resource and presented it to the school. June 2014 – By now I’m travelling all over the city by bus, car and on foot to meet all kinds of different community groups. By the end of 2015 we had created a network of 170 individuals from 78 different community groups. You can see where I went during the project on this handy map! We also started working with the York Normandy Veterans Association on a project to record their memories and preserve their archives for future generations. In 2015 we hosted a celebration evening for the Veterans and created a special short film about the project. July 2014 – To help manage over 400 community archives and to support outreach activities in 2015, Georgie and Francesca came onboard as Community Collection Assistants! 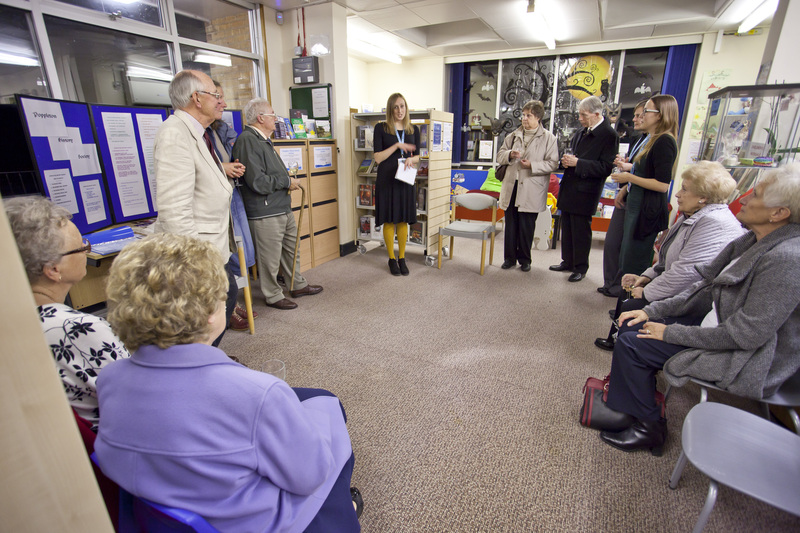 October 2014 – We launched the Poppleton History Society archive in Poppleton Library with an event to showcase the collection and network with members of the local community. 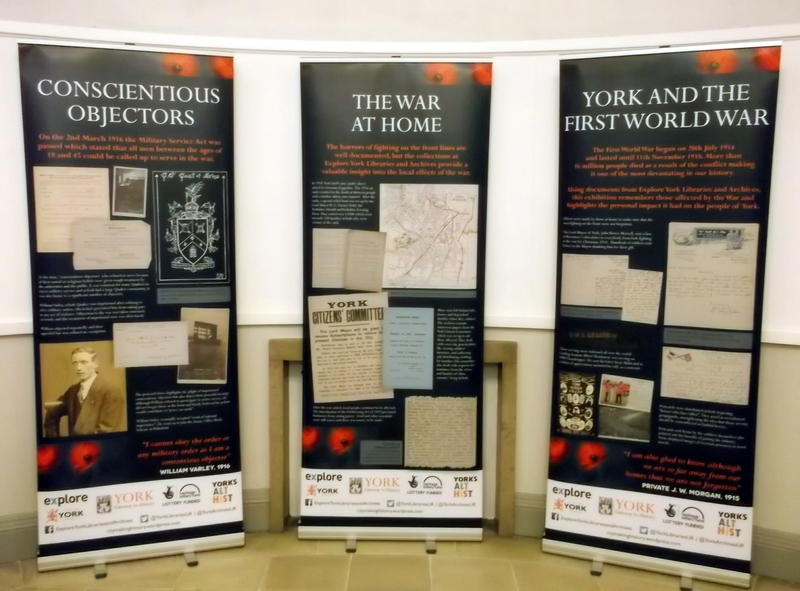 November 2014 – To support First World War commemorations we worked with York’s Alternative History Society to launch our pop-up banner exhibition. The banners went on display at York City Screen Cinema before being toured across all our libraries during 2015. 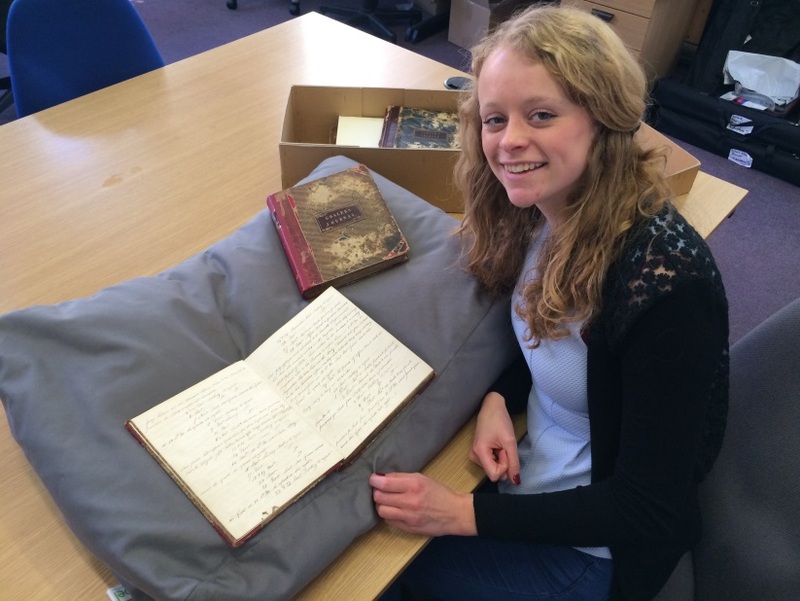 January 2015 – We opened our brand new Archives & Local History service at York Explore! During 2015 we welcomed a grand total of 94,858 visitors to the service who came to look at archives, browse our local history books and research their family histories. 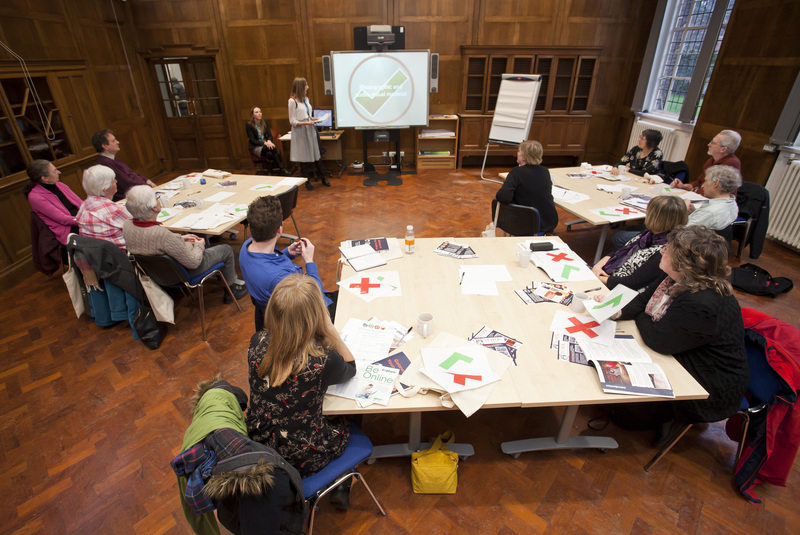 February 2015 – We hosted the first of our Gateway to Your Archives workshops. In total 98 representatives from 52 different community groups attended a workshop in 2015 and 98% said they felt more supported by Explore as a result. One of the Gateway to your Archives workshops in progress! If you are interested in learning about how to manage your community archive, all new resources will be launched onto the Explore website next month. Included in this will be our new training films, on YouTube now! 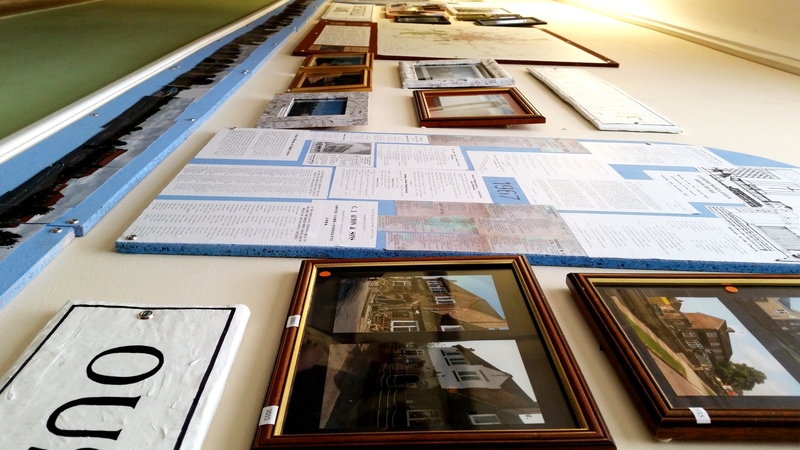 March 2015 – Alongside the Workshops came the Archives Roadshow. 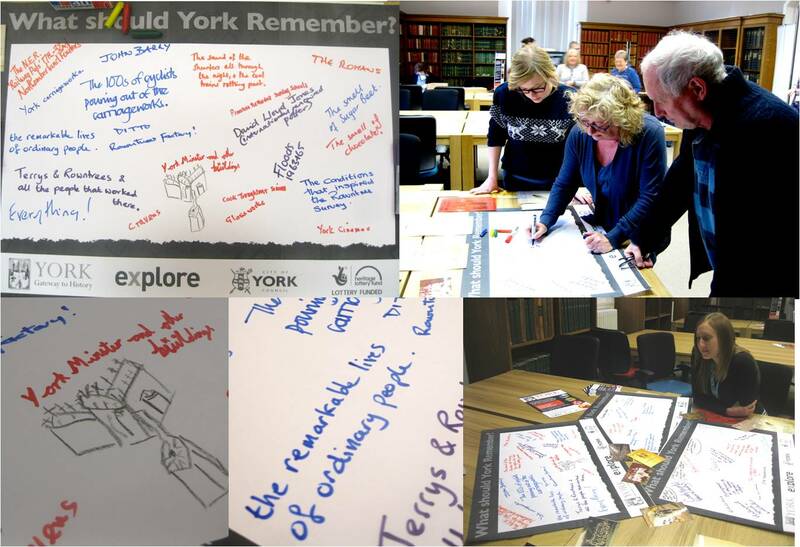 We toured all 17 of Explore’s libraries and asked people ‘What Should York Remember?’. We gathered 600 responses to the question and even created a vox-pop short film featuring local peoples thoughts! May 2015 – We said goodbye to Francesca and hello to Jenny as Community Collections Assistant. 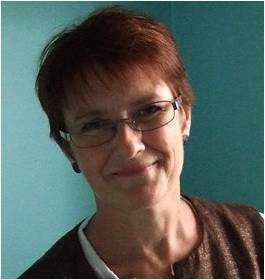 Jenny took over responsibility for cataloguing and supporting our outreach activities. 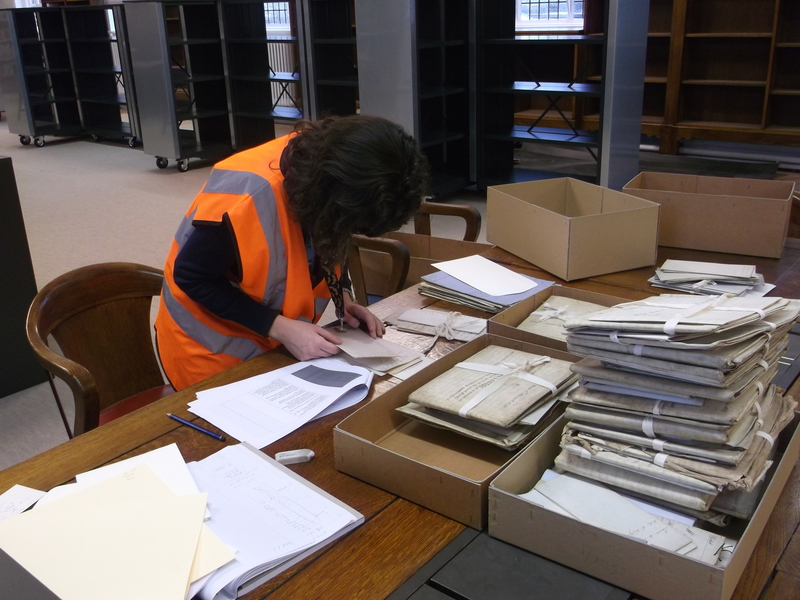 June 2015 – To help us catalogue our community archives we set up a Community Collections volunteer project. We got 8 volunteers in total who worked to catalogue 5 large collections adding up to 99 boxes, 203 volumes and 32 rolls! 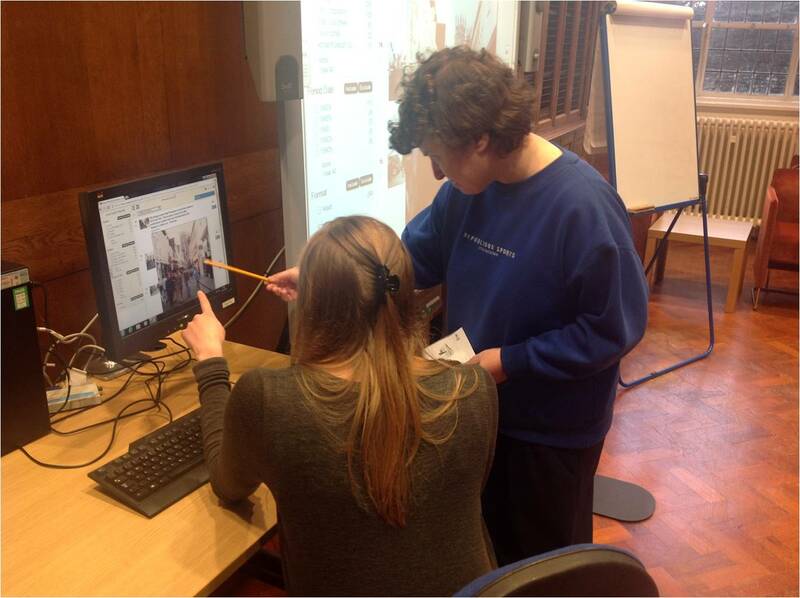 The volunteers also worked to create content for the Voices of the Archives booklet and pop-up banner exhibition. They provided quotes and unique insights into our community collections along with our community partners and researchers. 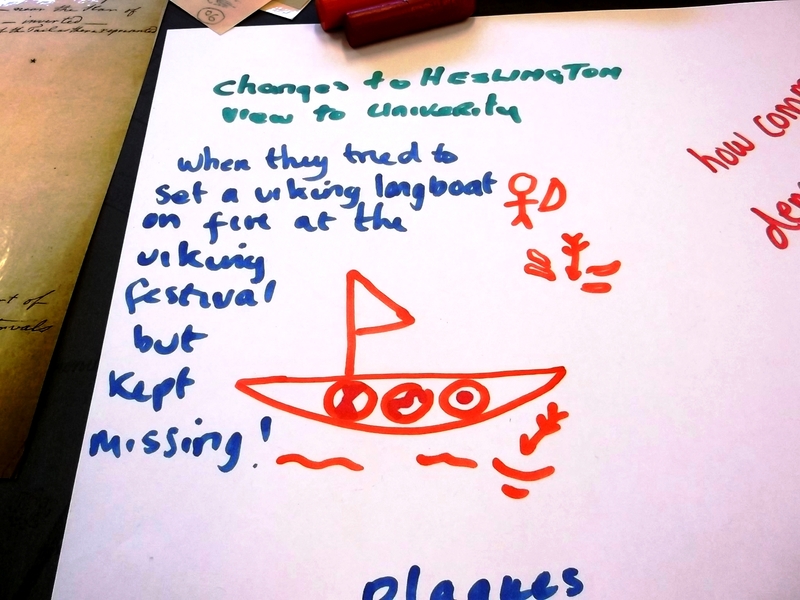 August 2015 – We worked with York Learning throughout the project to help adult learners explore the archives and use them as a starting point for art and creative writing. 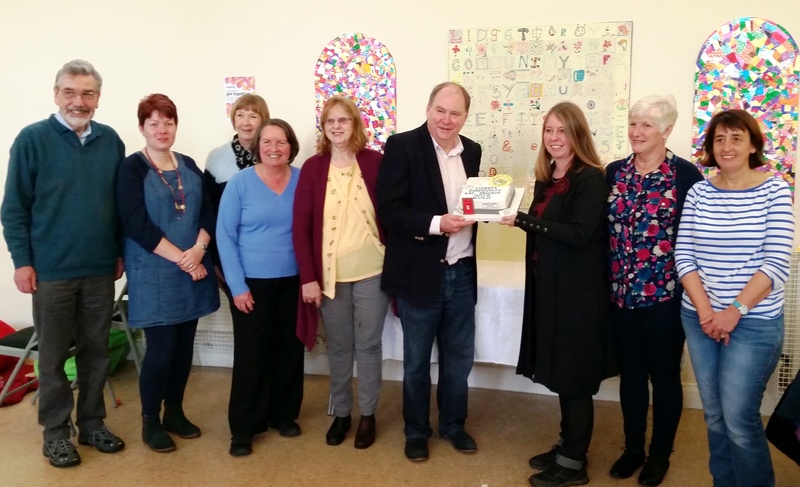 Learners on an art project explored the local history of Acomb to create a piece of public art in Lidgett Grove Church and we were invited along to the launch. 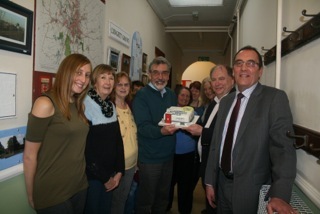 A local resident even made a special cake! September 2015 – We commissioned artist Emily Harvey to interpret the 600 responses from our ‘What Should York Remember?’ activity. She created York Panorama: What York Means to Us which is a tactile representation of how York’s residents and visitors view the history and culture of the City. It’s a permanent legacy to the project and is available on the 1st floor at York Explore Library and Archive! 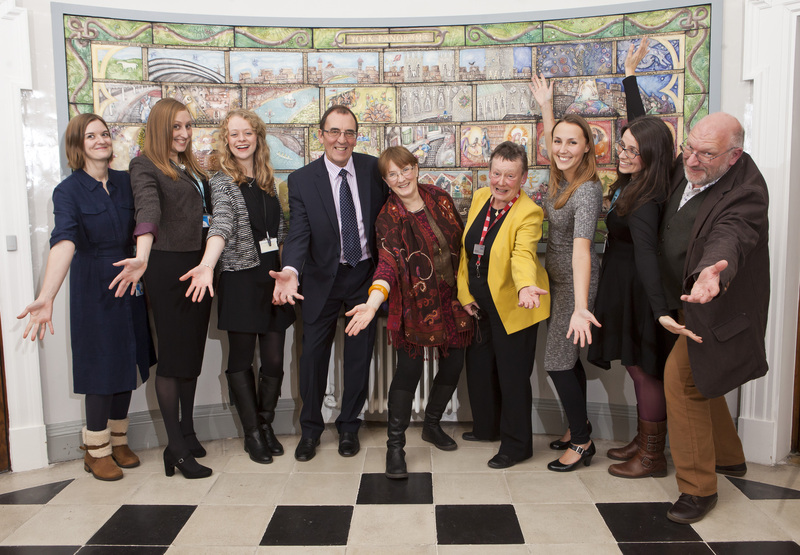 November 2015 – We finished off the project by hosting a celebration event at York Explore. City Archivist Victoria Hoyle and HLF Board Member Sue Mendus gave inspirational talks to our community partners and we all shared a drink to celebrate our success! 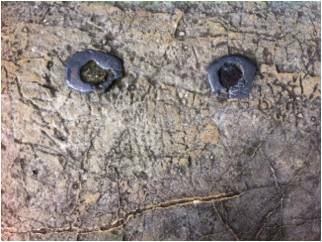 So here we are in March 2016 and we have completed our evaluation report and submitted it to the Heritage Lottery Fund. It was a chance to reflect on everything we have done and think about the future. A number of projects to engage adult learners in the archives were developed and I had the opportunity to be involved in a few of these and really see first hand how we can engage new audiences in archives and local history. The first project we got involved with was at Lidgett Grove Church in Acomb. York Learning tutor Donna Taylor was running a community art project with 7 learners, all from the local area. All of the learners had different skills, but all had an interest in local history and were keen to base their project around this theme. 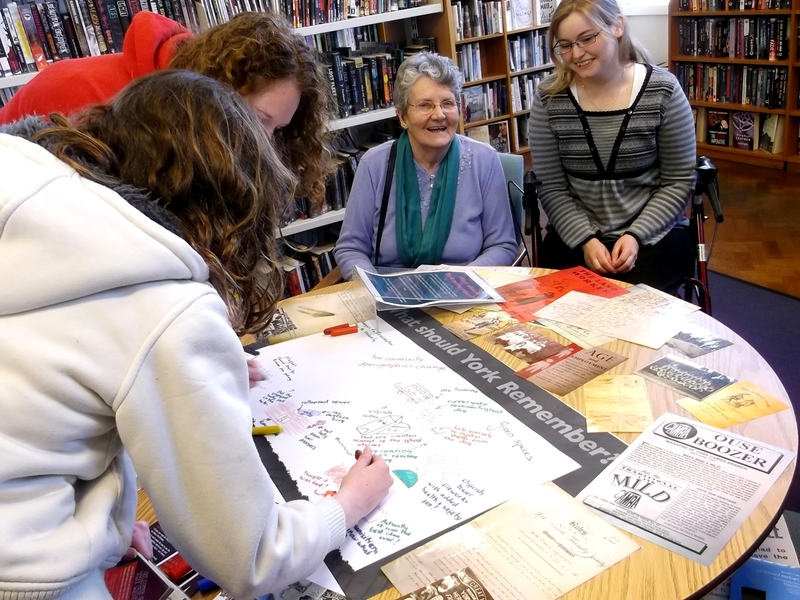 The learners visited the archives at Explore and researched the history of Acomb using historical maps and the Acomb Local History Society archive (Ref no: ACO). Based on the research the learners created a piece of community art along the corridor in Lidgett Grove Church. The Church is a local hub which hosts a lot of community events including a cafe once a week, so it was an ideal location to share a piece of local history! 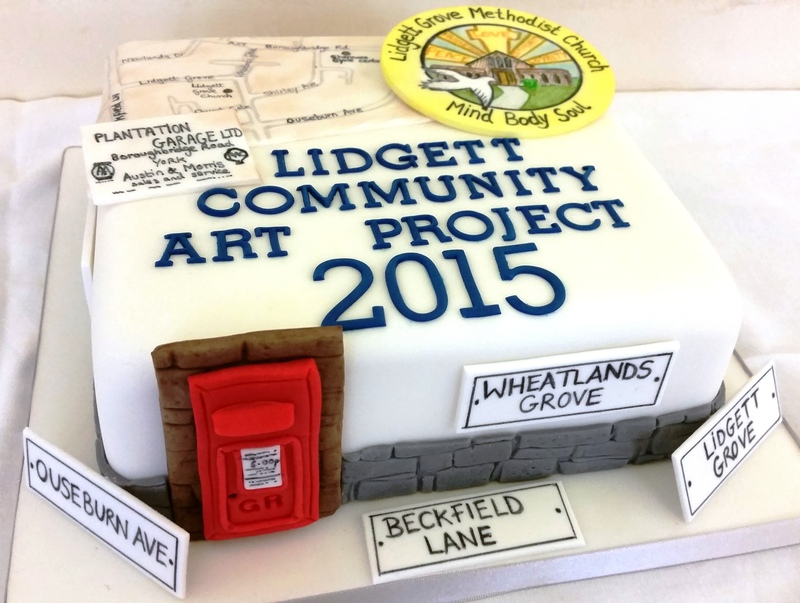 The final piece was launched in November 2015, and one local resident even made an art inspired cake especially for the event. 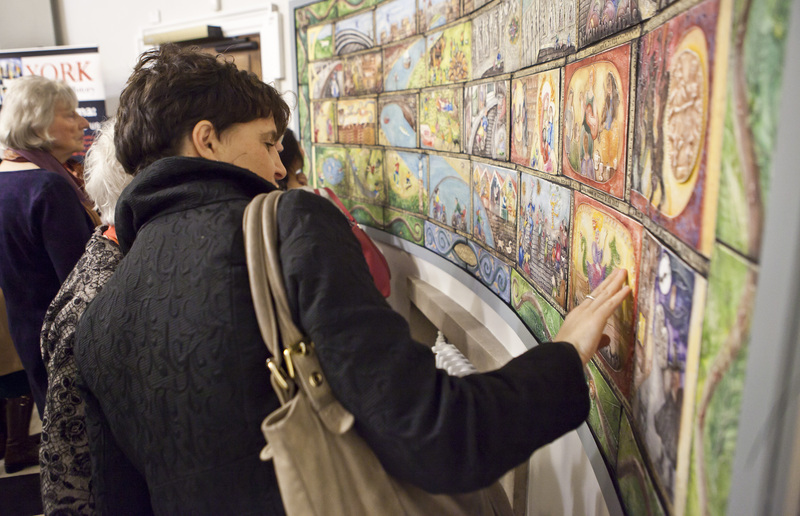 People of all ages engaged with the piece with maps of local streets proving particularly popular. Carefully crafted art inspired cake….a must for any launch event! 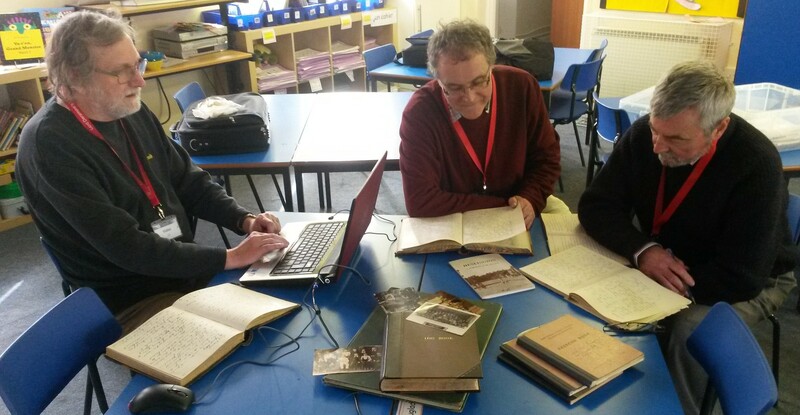 Learners seeking to improve their literacy skills also got involved with the archives to seek inspiration for creative writing. 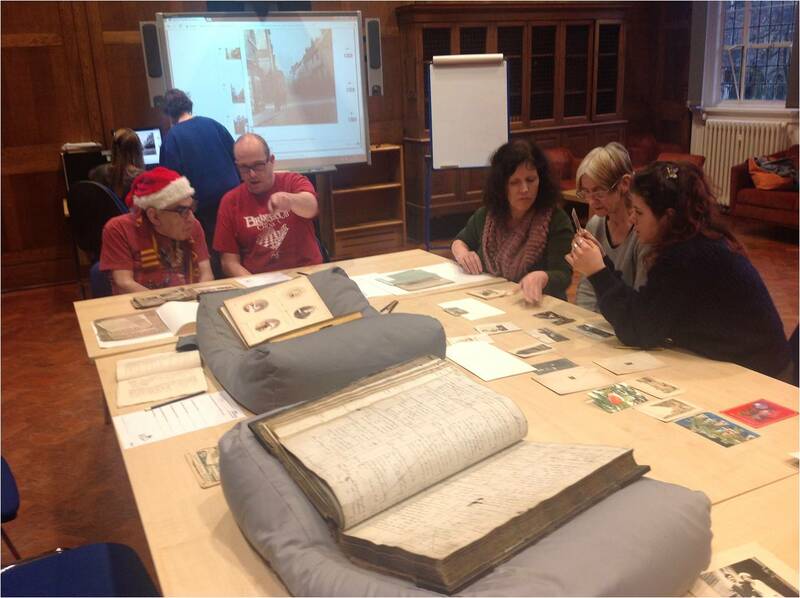 Two classes, ran by York Learning tutor Jayne Shipley, had the chance to look at a wide range of collections from past Christmas cards to a customer ledger for a local Tailor’s business. We even had a look at our Imagine York online image collections for inspiration! Using a mixture of written and visual materials meant we could cater for all abilities, and the learners are now busy writing stories about what they found the most interesting. It has been a fantastic experience sharing archives with groups of people who have never used an archive before. Their enthusiasm has been so rewarding and marks the start of a continuing partnership with York Learning to open up the archives to wider audiences. 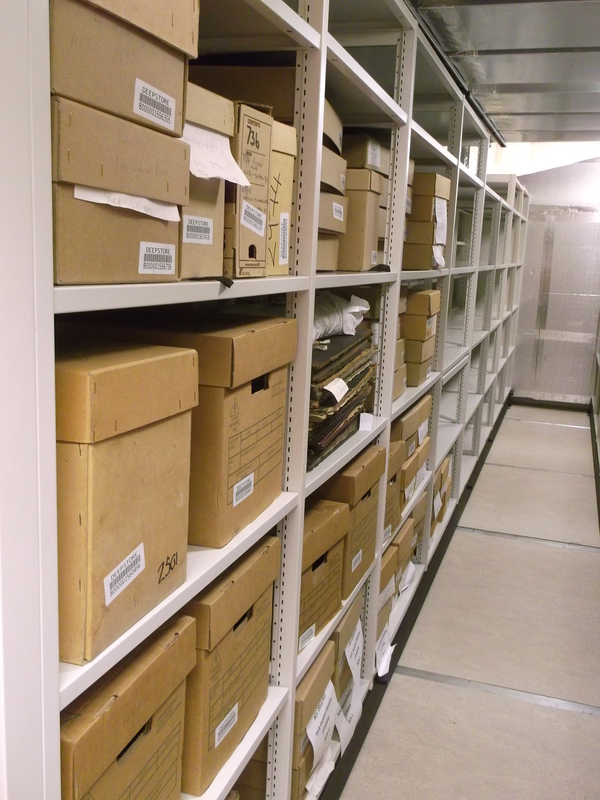 This week I wanted to share the journey of one of our archive cataloguing projects and how we made a 78 box collection accessible to the public for the first time. Our volunteers work incredibly hard and you’ve heard from and about them in our earlier blog posts and on social media. 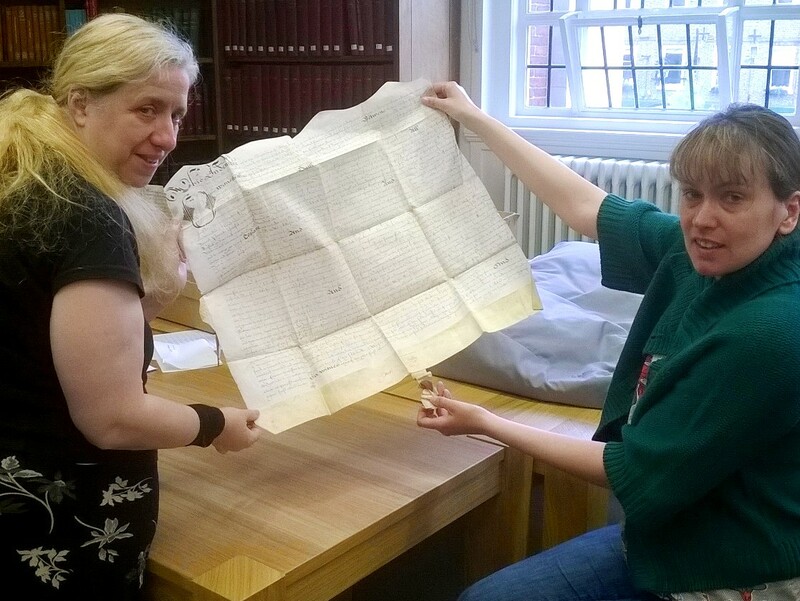 They dedicate their time to us every Thursday in the Archives Reading Room at York Explore. One of the largest community collections to have been brought back on-site was Ware & Co Solicitors. 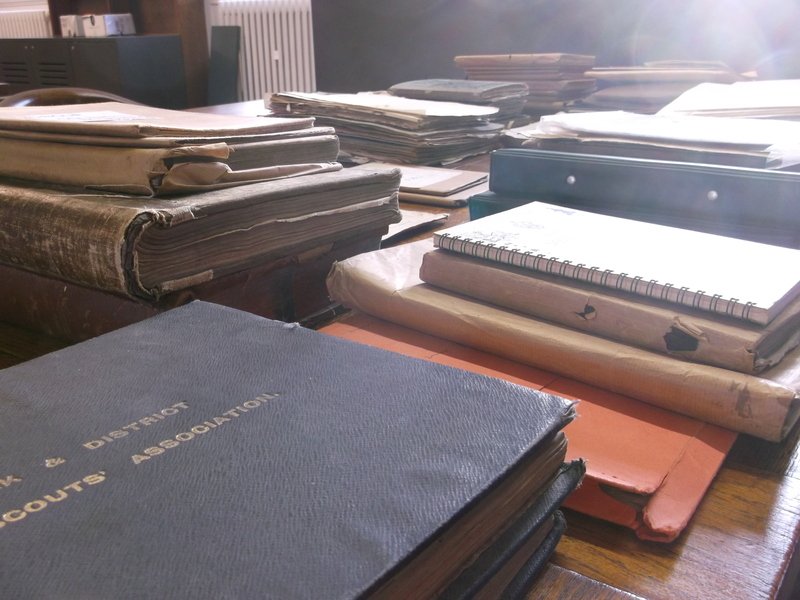 It’s a complex legal collection with documents relating to a wide range of Yorkshire families, properties and businesses. The challenge was how to organise such a large collection with so many different parts. The records themselves were also quite challenging as they date back to 1554 so can be difficult to read and interpret without specialist skills. Volunteers enjoying historical legal documents, complete with wax seal! Initially we thought that it might prove to be an easy collection, despite it’s size, as there was an old printed list and most of the boxes were labelled. We set the volunteers off checking items in the boxes against the list. The complexity of the records and the list meant this was slow going and we all started to feel like we were never going to get anything done! Families, properties and business were all mixed up together, often in poor condition, with many items not appearing at all on the original list. So we needed a new approach. The work the volunteers had done so far had given us a good idea of the types of records and their condition but it wasn’t sustainable to keep working at such a detailed level. Our new system was to first come up with an arrangement for the collection. We printed out the names of 67 families as well as 15 properties and businesses and set the volunteers the challenge of matching up the boxes to the names. Once all the boxes had been assigned a name, this gave us a starting point for writing catalogue entries. We chose to keep the descriptions brief as almost all of the collection consisted of the same types of legal records. 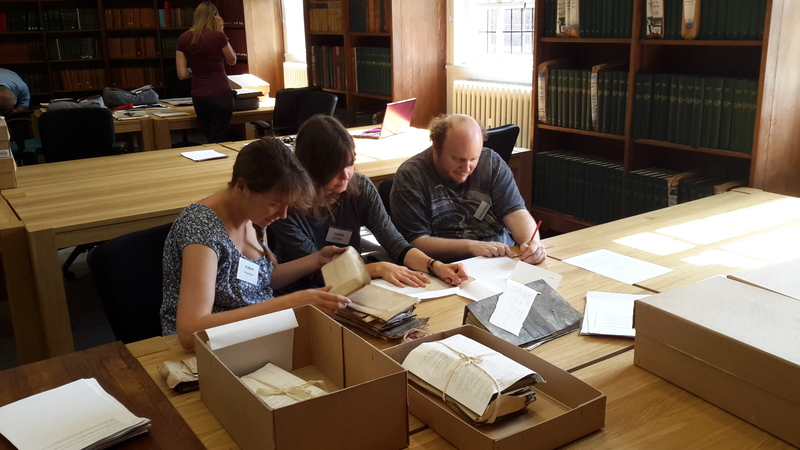 The volunteers, who by this time had a lot of experience using the collection, recorded the key details about the items including covering dates and a brief description of the documents. We also set our volunteer Richard the task of discovering more about each family. The information he found was especially important as some of these families have played a key role in the history and development of the local area. In just 4 weeks…that’s 80 hours…we had gone from a un-usable collection to one full labelled and searchable on the online catalogue. Without the support of our volunteers it would have taken one member of paid staff over 2 weeks to complete the collection…and that’s without them working on anything else! We learnt a valuable lesson on this project, that there is no ‘one size fits all’ approach to tacking an archive cataloguing project, and it’s something we’ll take forward to the rest of the archive team as we build a lasting legacy to the Gateway to History project. The full collection will be searchable via the online catalogue w/c 21st September with the reference no. WSC For further information about this collection please email jennifer.mcgarvey@exploreyork.org.uk. 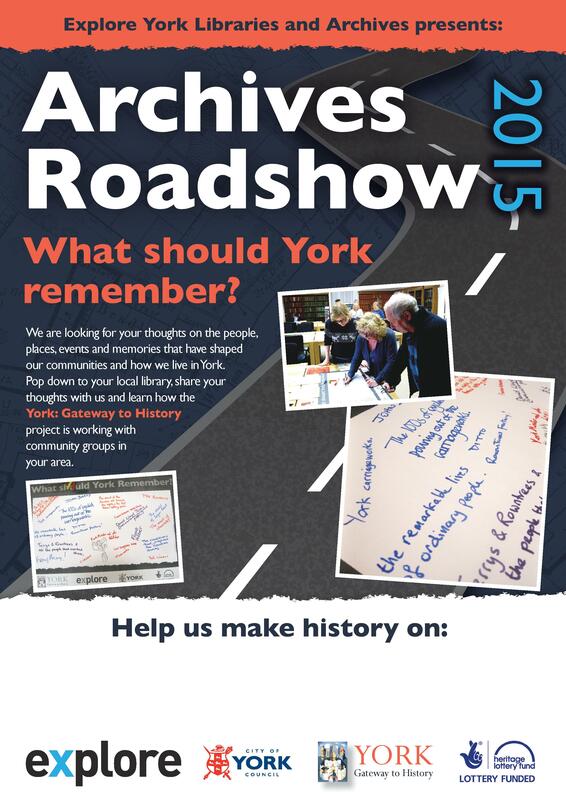 Do you remember at the start of the year we ran ‘What Should York Remember?’ and the Archives Roadshow? We mentioned there could be an art project in the pipeline and that you should wait for details….well your wait is over! I’m pleased to announce the results of the Roadshow and to launch ‘What York means to us’, a visual representation of York’s past, present and future through the voices of 600 York residents. We gathered a total of 600 spoken, written and artistic responses from residents aged 3-90 across York. These responses were then presented to local artists who pitched their ideas for a piece of legacy artwork, to tell a very local story of York revealing how the City sees itself. We chose Emily Harvey to scope, create and install the artwork as a legacy of the York: Gateway to History project. 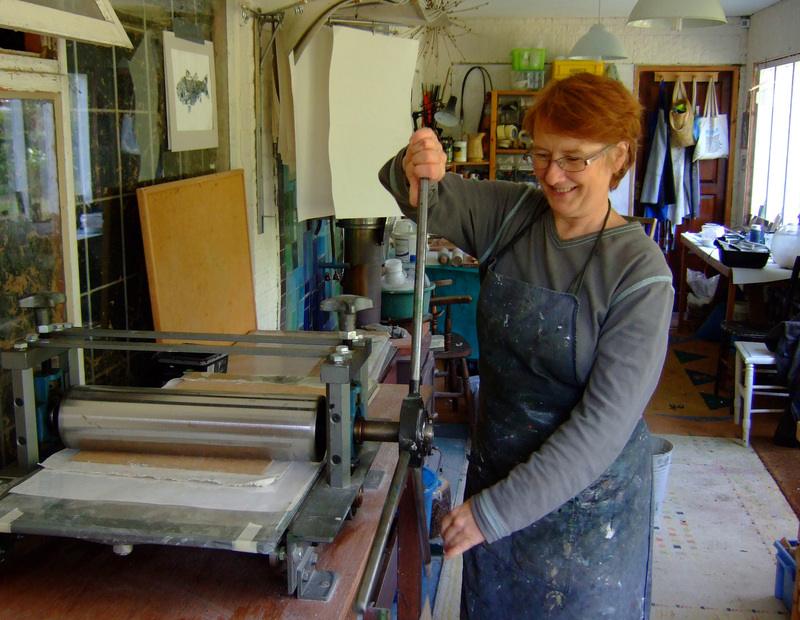 Emily has experience in community arts and one of her most recent projects was the collaborative creation of the banners that hung along the city walls during the Tour De France. 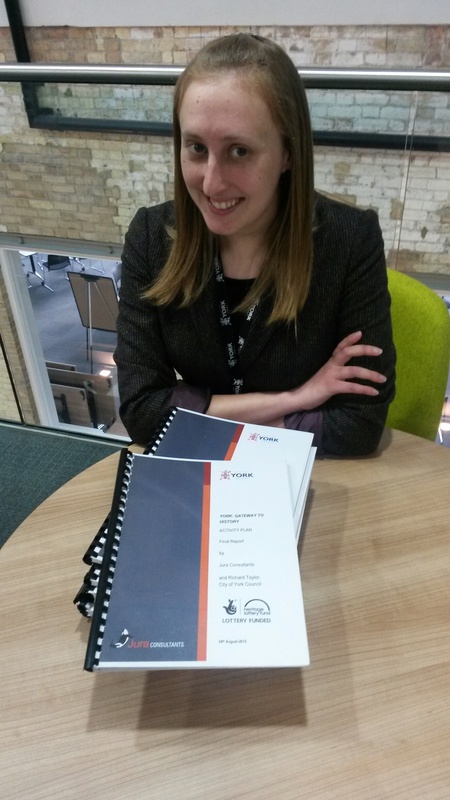 “I am really excited to be starting work on the panel for York Explore Library and Archives. This project brings together a lot of things I am interested in especially community arts, design, architecture, history, and public art. I started by reading through all the stories about York collected over the last few months, these have inspired a lot of images already which I have been sketching and researching. I got some funny looks when I was out taking close up photos of the walls – I must have looked like a very short sighted tourist! I particularly like the ones with accidental faces in them. 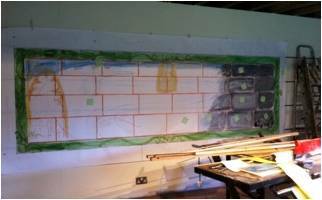 I also have a life size drawing on the wall of the studio to I can collect all the ideas together and get them into a coherent design. I am sure this will change and evolve over time. The wall in Emily’s studio is ready and waiting! Sample panels and sketches created by Emily as a taster of what’s to come! 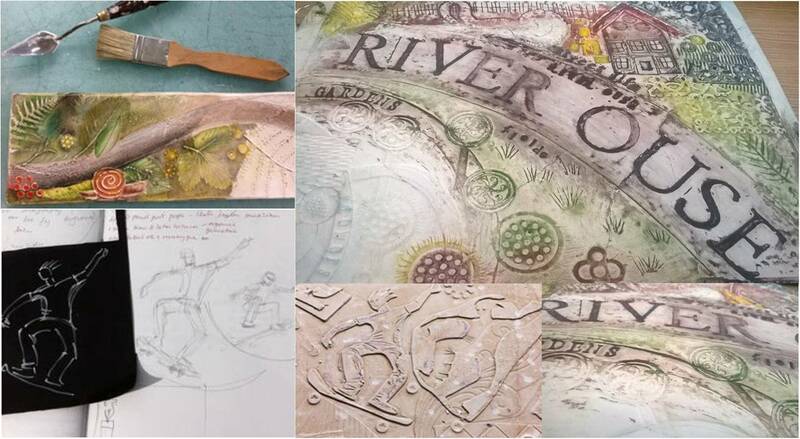 Emily has created some mood boards showing how she has been inspired, not only by the responses but also by the City Walls and our archive collections. These are on display on the 1st floor landing at York Explore where the final piece will be installed. What York means to us will be launched in November 2015 and be available to everyone to enjoy. If you or anyone you know contributed to this activity, pop along and see if anything you said is featured! Watch out in The Press over the next couple of weeks for a feature revealing even more about this exciting project! What makes you a Yorkie? The Archives Roadshow has been running since February 2015 and has been to 12 of our 16 branch libraries and gathered over 300 responses to our question ‘What Should York Remember?’ I’ve had this same conversation with people more times than I could count and it has led me to think a little more about what a sense of place really is and what truly does make you a Yorkie. So where does our sense of place come from, and at what point do we decide where we’re from? We tend to say that the place we spent most of our childhood is where we’re from even if we no longer live there or haven’t since we were teenagers or young adults. Where we grew up is perhaps part our individual identity that has shaped who we are today. I’m no exception, I’ve lived in York for just over a year but even if from now on I always live in York, I think I’ll always say I’m from Merseyside as its part of who I am and my journey to get here. We all have an important part to play in the past, present and future of the communities we live in. Several people have commented on the Roadshow that ‘York is like a big village’. I’d certainly agree with that but around 70% of people we’re spoken to on the Roadshow didn’t grow up in York. How does the fact that so many of us don’t associate ourselves with being from York affect our almost taken for granted community cohesion, in a city already so crowded with tourists? I believe that everyone has some attachment to the city, especially if you’ve lived here for 30 years, so I always ask, ‘How has your community changed since you’ve lived here?’ I’ve found this to be a great way of exploring personal community connections and usually encourages people to share stories about their own children and grandchildren such as ‘feeding squirrels in Museum Gardens’. Childhood, whether it’s your own or your family’s, seems to increase our attachment to a place. It’s not just places that people are attached to as there seems to be a real sense of ownership around recent local events such as the Tour De France and Tour De Yorkshire. Perhaps it reveals the true social value of these events as well as attracting tourism and funding. Roadshow attendees feel a strong connection to events that take place in the city such as the Viking Festival. Our experiences in local places and feeling part of events play a vital role in community identity. The responses to ‘What Should York Remember?’ give us a snapshot in time as to what is important to residents in 2015, whether they have been in the city all their lives or just a few months. So what does make you a true Yorkie? Someone on the Roadshow said it wasn’t until you’ve seen the Minster without scaffolding. We might be waiting a long while for that to happen but maybe as soon as you move to York you become a Yorkie, after all are we not part of one big village? Coming soon – Wondering what we’re planning do to with the 300 ‘What Should York Remember?’ responses? Well watch this space for a sneak preview of what’s coming up later this year. This year we’re pleased to announce that we’re taking archives and local history out across Explore’s branch libraries in our first ever Archives Roadshow. 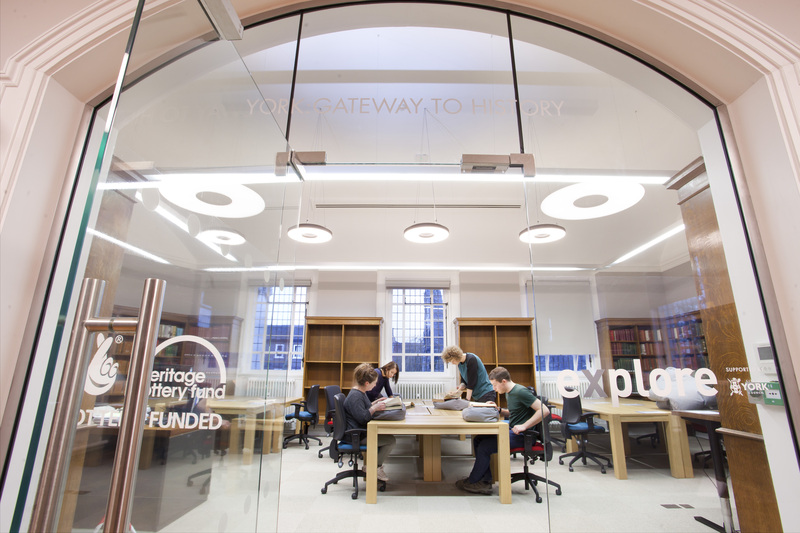 We’re thrilled with our new archive service at Explore York but we know that for many of you, the local library is still the heart and soul of your community. That’s why Francesca and I will be touring all branch libraries during 2015, giving you a chance to discover more. Seen these leaflets around? It’s all Gateway to History! 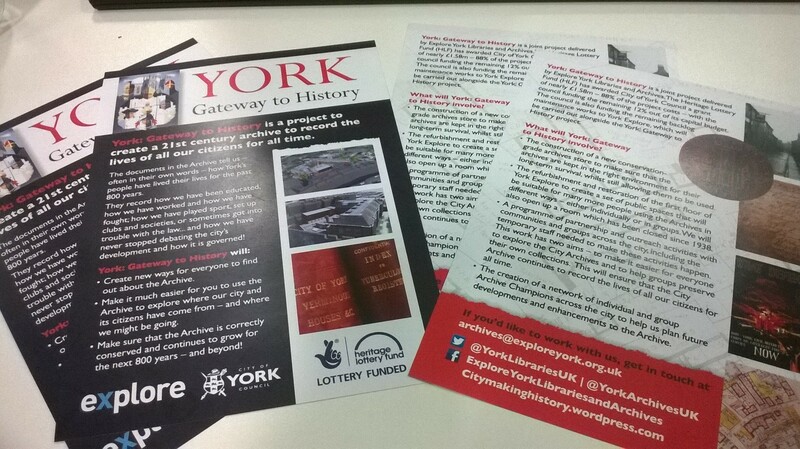 Expect to see shiny pop up banners and leaflets advertising the Gateway to History project and the Gateway to Your Archives training workshops; discover how to use the archive catalogue; see copies of items from our community archives; ask us all about the new archive service and share your local history stories with us. But we’d like you to get involved as well. Throughout 2015 we’re asking you, What should York Remember? We want your thoughts on the people, places, events and memories that have shaped our city and the way we live. We launched this event at Residents Festival in York Explore on 31st January and we got some facinating responses including ‘The remarkable lives of ordinary people’, ‘the smell of chocolate’ and ‘disability rights in York’. We had some truly inspirational discussions and even some children popped in to draw us a picture of York Minster! Expect to see us at each branch library at least twice throughout 2015 and we’ll be advertising more dates throughout the year. Keep a look out for this eye catching poster in your local library to see when we’re next coming to you! 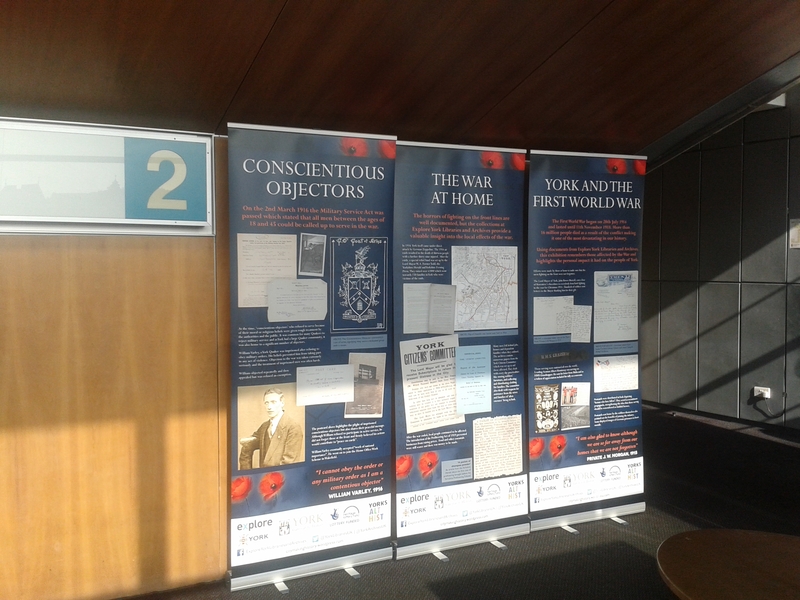 From April 2015, you’ll also get a chance to see our popular WW1 pop-up banner exhibition as it tours the branches. Its currently upstairs in the foyer at York Explore Library so if you’re popping in, take a look. Check with your local library over the coming months and discover when its coming to you. We look forward to meeting you all as we travel around the city and discover what York should remember! The Community archive collections are coming! 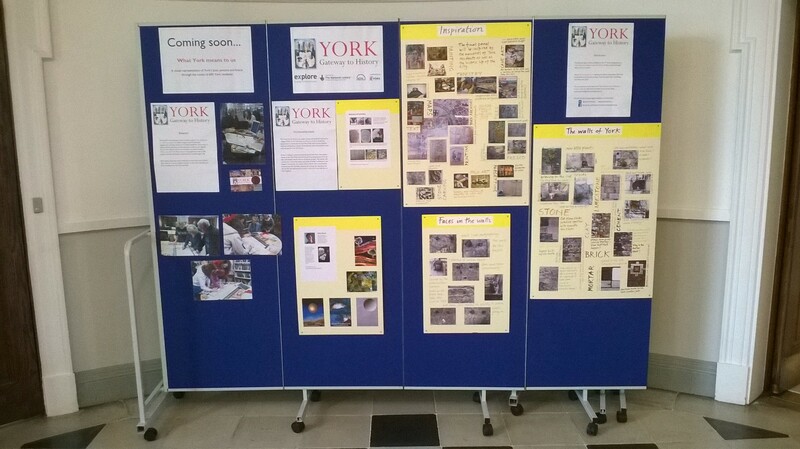 January 5th is fast approaching and the whole team is busy preparing York Explore for opening. 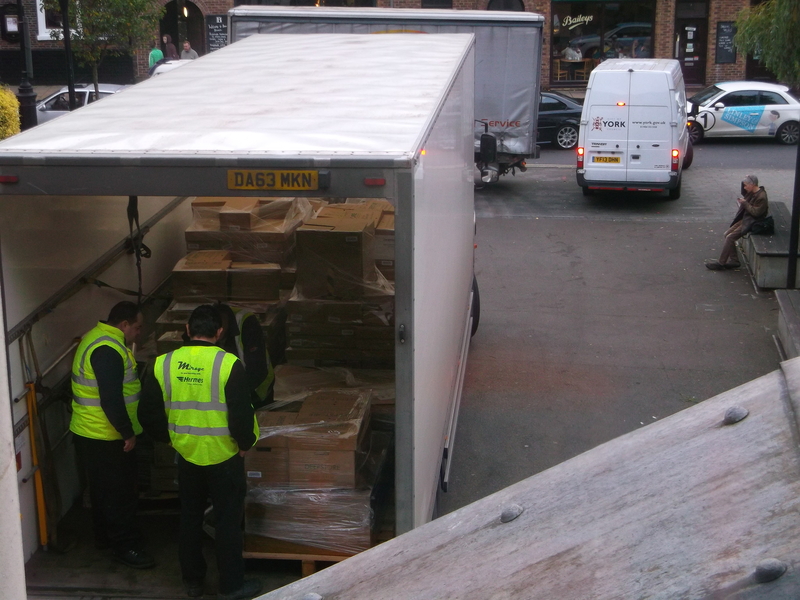 Right now a team of library and archive staff are hard at work stocking the shelves and preparing archive collections. Preparing the archives has been a process that Francesca, Georgie and I have been working on since August and we were all so excited when we got a huge scale delivery from Deepstore two weeks ago. It was the first time since I started my job back in January that I had actually seen the community collections I manage. The archives arriving from Deepstore from the salt mines in Cheshire where the archives have been kept safely while we built our strongroom. We had around 300 boxes delivered, most of which were Civic records to be processed by Justine but it also included some previously inaccessible community collections. We haven’t had everything sent back as we are doing this gradually to make sure that the collections we make accessible are catalogued and properly packaged. Due to the hard work, and a real team effort, we’re pleased to announce that so far we have 15 community collections ready for researchers to use when our doors open. Justine is hard at work making sections of the Civic archive ready, which will form the bulk of the archives ready for use. The Boy Scouts collection is full of exciting finds including loads of troop photographs and log books! All of the collections we have available will be searchable via the Library catalogue and we’re currently working on a programme of work which will allow us to continue making collections accessible gradually throughout 2015. We’re creating a Pinterest board to showcase these collections, similar to the one we have for our First World War material. We’ll also be sharing collection updates via our website and here on the blog. Finally, I just wanted to say a huge thanks to Georgie who is a Reading and Learning Advisor at York Explore. She came across to this project on secondment to gain archive experience and she has been responsible for half of the collections we’re making accessible in January. You’ll probably see Georgie around the library as she is returning to her previous role and will be working in all areas of the library and archive service. Francesca has been responsibe for the other half of the collections and you’ll also see her and myself around as she’ll be working with me throughout 2015 to deliver outreach activities. I’ll be blogging shortly with more details about what you can expect to see from the Gateway to History project next year. Welcome to the archives blog for Explore York Libraries and Archives, the community benefit society delivering York's city libraries and archives service. Enter your email address to receive notifications of new posts as soon as they are published. 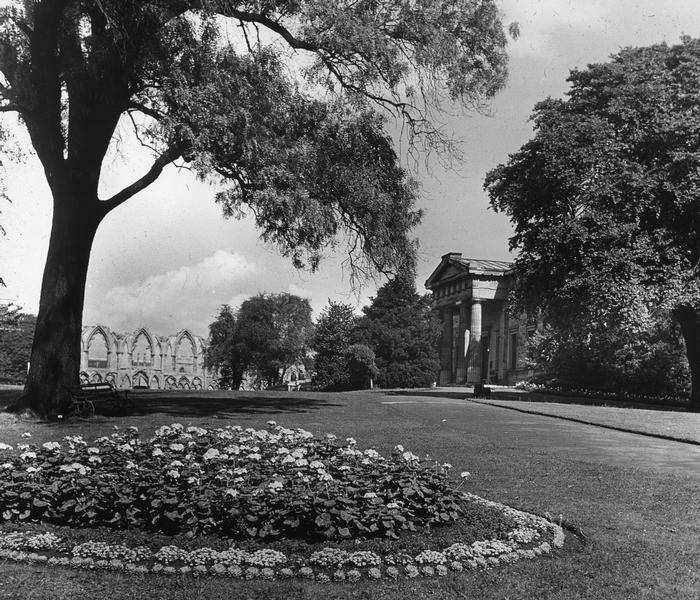 Unless otherwise stated all images are the copyright of either the City of York Council or Explore York Libraries and Archives Mutual Ltd. Any finding numbers given for documents are provisional and are not intended for citation.